Happy Earth Day! It’s a shame that many people only think about caring for our planet once a year, but I guess that is better than nothing. I will be posting Day 126 later today about a man who has dedicated his life to saving our country and planet. His story tonight. Many people ask how they can help me. This week I received a check from a friend of mine and four gift certificates from a follower named Tawanna. A few weeks ago a man from California sent me a donation via PayPal to sponsor ten days of giving. Although all of these efforts are greatly appreciated, I would encourage you to think about how you can help those on the Lend a Hand page or individuals and organizations in your local community. I promise to put the donations that I receive to good use, although, I can not accept money for my $10 daily commitment. I made the $3,650 commitment myself and I don’t feel that it is fair to accept donations for my own personal commitment. I am in the process of studying the possibility of creating a nonprofit that would help manage and distribute funds that I receive in a responsible manner. I hope you don’t take this the wrong way. Call me stubborn! Larry and Kelly from California told me yesterday that, “to be a great giver, you also have to be a good receiver.” What do you think? 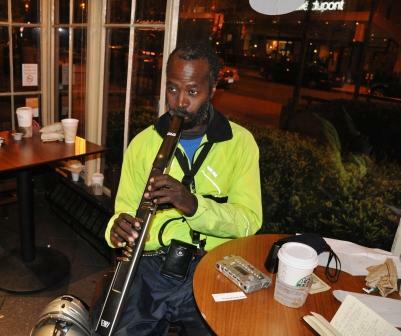 On Day 125 I was walking by Starbucks at Dupont Circle and saw a man playing a clarinet-like instrument inside the coffee shop. I had seen him playing there before, but didn’t have time to stop. I went inside and saw that the instrument is connected to a small electronic device that connects to earphones. He was deep in concentration. I nervously walked around pretending to be interested in anything but him. Finally I just bit the bullet and walked up to him and asked if I could talk to him for a minute. That minute turned into two hours. Gravett is a musician who is practicing on a EWI4000s. It’s an electronic saxophone. I used to play saxophone. My band instructor, Mr. Snyder, I am sure would agree that the saxophone was not my calling in life. 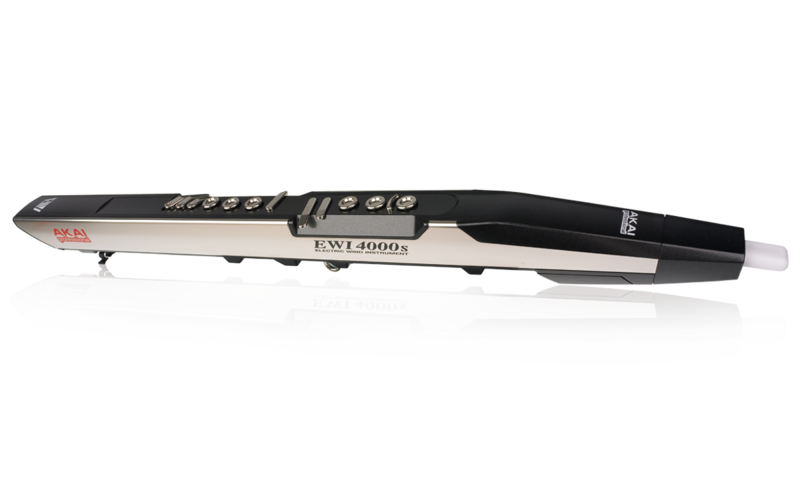 The real benefit of the EWI4000s is that it has an internal sound module that stores the sounds/tones that the instrument produces rather than relying on an external modulator. This allows Gravett to not have to carry around bulky equipment to hear the sound he is producing. Pretty cool. I asked him how he makes a living and he said he played the saxophone and worked as a pedicab driver in DC. Pedicabs are bicycle powered cabs. Very timely that I should write about him and his pedicab on Earth Day. Gravett has returned to Washington DC last year after spending time living in Mexico City, the Czech Republic, and Jamaica. I told him that I had given $10 to another saxophone player on Day 100 (Bill). He nodded his head and said he knew him. “Bill is really talented” he said. Ellicott and Banneker to salvage the plans. By the way, for those of you in Maryland, Ellicott and his two brothers established Ellicott Mills, later renamed Ellicott City. Gravett is someone who lives in the present. He believes that communication is only real when it is live and spoken. Sounds are only real when they are produced live from their original source. We spoke philosophically about these and many items. Some things we agreed upon. Others we did not. But that is ok. In the spirit of the legendary newscaster Ron Burgundy, we agreed to disagree. I enjoyed chatting with him so much that soon we were being asked to leave as the coffee shop was closing. Because that is what we were really doing. We were both sharing; sharing our time, our ideas, our questions, etc. Had I not been doing this project, I don’t think I would have ever stopped to talk to Gravett. I probably would have lived the rest of my life never knowing about Benjamin Banneker. Gravett did tell me something that you could help him with. He would like information on living in Guatemala. In particular, he is interested in extremely low-cost housing information as well as general safety issues. He hopes to move there this summer. If you have information or know where he can research this better, please leave a comment.